Charles B. (Charlie) Rangel was born on June 11, 1930, in Harlem, New York City, to Blanche Wharton and Ralph Rangel. The second of three children, he was raised by his mother and his maternal grandfather, Charles Wharton.3 From 1948 to 1952, Rangel served in the U.S. Army and was awarded the Bronze Star and the Purple Heart for his service in the Korean War when he led 40 U.S. soldiers from behind enemy lines despite being wounded himself.4 After returning to New York and graduating from DeWitt Clinton High School, Rangel earned a bachelor of science degree from New York University under the GI bill in 1957. Three years later, he completed a JD at St. John's University Law School. In 1960 Rangel passed the New York bar and began practicing law. In 1963, U.S. Attorney General Robert F. Kennedy appointed him Assistant U.S. Attorney for the Southern District of New York. He later served as an aide to the speaker of the New York assembly and was counsel for the President’s Commission to Revise the Draft Laws.5 On July 26, 1964, Rangel married the former Alma Carter. They raised two children, Steven and Alicia. 1Thomas Kaplan, “Rangel Fends Off Challengers to Win a Congressional Primary,” 27 June 2012, New York Times: 19. 2Paul Kane, “Charlie Rangel on the End of His Era,” 29 June 2016, Washington Post, https://www.washingtonpost.com/news/powerpost/wp/2016/06/29/charlie-rangel-on-the-end-of-his-era-this-guy-from-lenox-avenue-is-retiring-with-dignity (accessed 26 January 2017). 3Rangel had a fraught relationship with his father Ralph Rangel, who left the family when he was young. See John Eligon, “Even When His Latino Roots Might Help Politically, Rangel Keeps Them Buried,” 22 May 2012, New York Times: A17. 4“Charles B. Rangel,” in Current Biography, 1984 (New York: H. W. Wilson and Company, 1984): 338. 5Linda Charlton, “Productive Politician: Charles Bernard Rangel,” 25 June 1970, New York Times: 48. 7Paul Good, “A Political Tour of Harlem,” 29 October 1967, New York Times Magazine: SM34; “Charles B. Rangel”: 338. 8Charles Rangel and Leon Wynter, And I Haven’t Had a Bad Day Since (New York: St. Martin’s Press, 2007): 163–164. 9Thomas P. Ronan, “Rangel, Calling Powell a Failure, Says He Will Seek Congressional Post,” 21 February 1970, New York Times: 24. 10In that initial election, Rangel also ran on the Republican ticket, which ensured he would be on the ballot in November regardless of the primary outcome. Office of the Clerk, U.S. House of Representatives, “Election Statistics, 1920 to Present,” http://history.house.gov/Institution/Election-Statistics/Election-Statistics/. 11William L. Clay, Just Permanent Interests (New York: Amistad Press, 1992): 121. 12Clay, Just Permanent Interests: 187. 13Tax Reform Act of 1986, H.R. 3838, 99th Cong. (1985); “Biography,” on Representative Charles B. Rangel’s official website, accessed 27 November 2007, http://www.house.gov/rangel/bio.shtml (site discontinued). 14Almanac of American Politics, 2000 (Washington, DC: National Journal Group, Inc., 1999): 1138; Politics in America, 2006 (Washington, DC: Congressional Quarterly Inc., 2005): 725–726; see also “Biography,” on Representative Charles B. Rangel’s official website, accessed 25 September 2006, http://www.house.gov/rangel/bio.shtml (site discontinued). 15Rangel and Wynter, And I Haven’t Had a Bad Day Since: 52–53. 16“About Us,” Charles B. Rangel International Affairs Program, Howard University, accessed 4 April 2017, http://www.rangelprogram.org/index.cfm?areaid=2&contentid=701&mcontent=y (site discontinued). 17Mark Jacobson, “Chairman of the Money,” 24 October 2007, New York Magazine, http://nymag.com/news/politics/26290/ (accessed 3 February 2017). 18Congressional Record, House, 110th Cong., 2nd sess. (20 May 2008): Heroes Earnings Assistance and Relief Tax Act of 2008, H4187; H.R. 6081, 110th Cong. (2008). 19Rangel and Wynter, And I Haven’t Had a Bad Day Since: 176; Clay, Just Permanent Interests: 290–292. 20Ceci Connolly and Eric Pianin, “In Rangel’s Pursuit, Means Pave the Way,” 5 June 2000, Washington Post: A4. 21Rangel and Wynter, And I Haven’t Had a Bad Day Since: 241–243; Richard Simon and Justin Gest, “House Committee Erupts Into Partisan Maelstrom,” 19 July 2003, Los Angeles Times: A1; Juliet Elperin, “Ways and Means Chairman Apologizes to House,” 24 July 2003, Washington Post: A1. 22Politics in America, 2010 (Washington, DC: Congressional Quarterly, Inc., 2009): 712. 23David D. Kirkpatrick, “With Power in Congress, Blacks Also Get Conflicts,” 6 December 2006, International Herald Tribune (NY): 6. 24Jan Austin, ed., “Landmark Health Care Overhaul: A Long, Acrimonious Journey,” CQ Almanac 2009, 65th ed. (Washington, DC: CQ-Roll Call Group, 2010): ch. 13, 3–14, http://library.cqpress.com/. 25The alleged improper use of office included using congressional stationary to fundraise from organizations with interests before his committee for a City College building being erected in his name. For more, see John Bresnahan, “Rangel Decision Pending Investigation,” 9 December 2008, Politico, http://www.politico.com/story/2008/12/rangel-decision-pending-investigation-016333 (accessed 10 December 2008); Politics in America, 2010: 713. 26Congressional Record, House, 111th Cong., 2nd sess. (10 August 2010): H6602. 27Paul Kane and Perry Bacon Jr., “Rep. Charles Rangel, Democrat of New York, Leaves Ways and Means Chairmanship,” 4 March 2010, Washington Post: A1; Politics in America, 2012 (Washington, DC: Congressional Quarterly, Inc., 2011): 690. 28Almanac of American Politics, 2012 (Chicago: University of Chicago Press, 2011): 1157. 29Two Republicans voted against censure: Peter T. King of New York and Don Young of Alaska. Only one CBC member voted in favor of the measure. For more, see David Kocieniewski, “Rangel Censured Over Violations of Ethics Rules,” 2 December 2010, New York Times: A1. 30Paul Kane, “Despite Ethics Cloud, Rangel Easily Wins Primary,” 15 September 2010, Washington Post: A10. 31Karen Freifeld and Edith Honan, “Rangel Rival Challenges Primary Results,” 2 July 2012, Reuters, http://www.reuters.com/article/us-usa-campaign-newyork-idUSBRE86115420120702 (accessed 31 January 2017). 32Kate Taylor, “Rangel Wins House Primary Rematch,” 26 June 2014, New York Times: A23. 34Politics in America, 2014 (Washington, DC: Congressional Quarterly, Inc., 2013): 690. Papers: The papers are not yet open to the public. Oral History: 2009, 27 pages. An oral history interview with Congressman Charles Rangel conducted by Steve Rowland on April 6, 2009. Oral History: 2003, amount unknown. An oral history interview of Charles Rangel conducted on July 22, 2003. 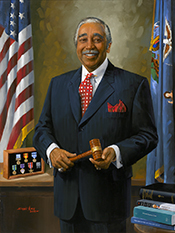 "Charles B. Rangel" in Black Americans in Congress, 1870-2007. Prepared under the direction of the Committee on House Administration by the Office of History & Preservation, U.S. House of Representatives. Washington: Government Printing Office, 2008. Ralph Nader Congress Project. Citizens Look at Congress: Charles B. Rangel, Democratic Representative from New York. Washington, D. C.: Grossman Publishers, 1972. Rangel, Charles B. and Leon Wynter. And I Haven't Had A Bad Day Since: From the Streets of Harlem to the Halls of Congress. New York: Thomas Dunne Books, 2007. ___. "The Caribbean and Our Drug War." TransAfrica Forum 7 (Summer 1990): 39-43. ___. "Charitable Giving and the Gross National Product." Black Scholar 7 (March 1976): 2-4. ___. "The Golden Triangle." Journal of Defense and Diplomacy 5 (1987): 44-49.